I feel like since I got back from our retreat up in Shipshewana, I've hit the ground running.....and I haven't stopped. I've done some Christmas decorating. I sort of do that all month just taking my time and enjoying all of the decorations. I really enjoy all of the homemade things: the Christmas quilts, crocheted tree skirts and afghans are some of my favorite things. I have the stockings hung and another small tree by the fireplace. Do you remember bubble lights? The ones in this photo have been around for a lot of years. You can see Tiki on his purr pad. He is waiting for someone to give him some fresh snack in his china bowl on the mug rug in front of the fireplace. I still have to finish quilting his Christmas quilt for in front of the fireplace. On Saturday my daughter and I went downtown to Mass Ave Knits for a Christmas make and take. I made this tiny scarf in a glass ornament. This afternoon I finished the gold four patches so I'm caught up with the Bonnie Hunter Aletaire mystery quilt for 2015. I also finished the last of the nine patches for the Yes Kevin, I Can Do Scrappy mystery quilt done by Ann at Attic Threads & Quilts blog. This is the tree in my sewing room. Tiki's box is at the left, and he likes to sit on the stool at the right while I sew. I know it's a busy time for everyone, but I hope you take some time out for yourself to do a little stitching or something else you enjoy. Tomorrow I'm going to sew and have lunch with friends. I hope to finish the friendship stars so that I can put the Yes Kevin, I Can Do Scrappy mystery quilt top together. As you probably know, Bonnie Hunter has started her annual Mystery Quilt. She posts the clues every Friday starting the Friday after Thanksgiving. This year's quilt is called Allietare and has a rusty red and gold plus black, grey, and neutrals. I love the finished quilts from her mysteries, and I love the colors she is using this year. This is my Orca Bay mystery quilt from 2011. The pattern can be found in Bonnie Hunter's book String Fling. This is my Roll Roll Cotton Boll, Bonnie's 2010 mystery. The pattern can also be found in the book, String Fling. I really love these two quilts with string blocks, and I hope there will be another mystery using strings again soon. I finished these blocks at the retreat I just attended. This is (or will be) Easy Street, Bonnie's 2012 Mystery Quilt. I was hoping to get the other 9 blocks sewn and have the top sewn together before this year's mystery started. I missed a couple years of mysteries because we were getting ready to move. Here are the parts of my Allietare mystery so far. All of my cutting is done, and I hope to find some time to sew everything this week so that I can keep up. My grey looks like a light blue in this photo for some reason. I'm also doing the mystery in honor of Kevin the Quilter called Yes, Kevin, I Can Do Scrappy. 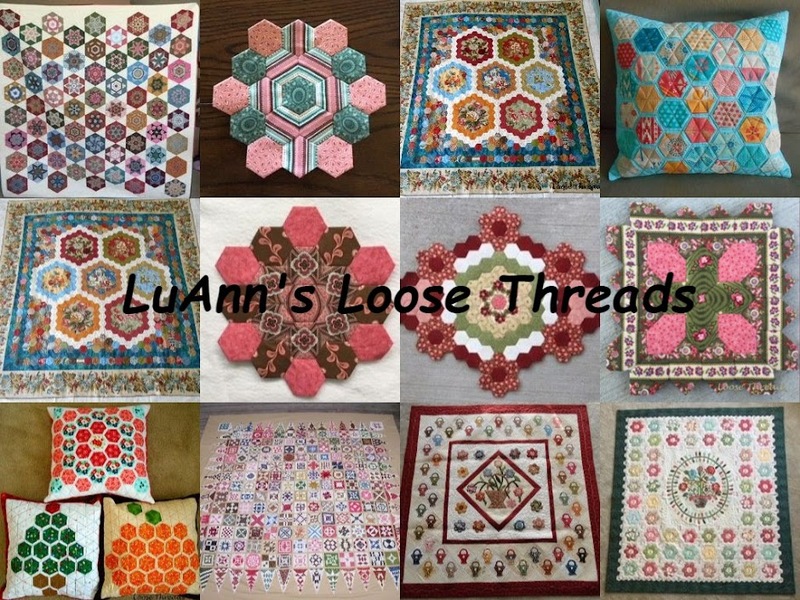 This mystery is done by Ann of Attic Threads & Quilts blog. She has dedicated this mystery quilt to Kevin because he challenges her to get out of her comfort zone and love scrappy quilts. This quilt is cut from 2 1/2" strips. I used parts of a couple of Christmas jelly rolls that were in my stash. I have a lot of Christmas fabric and cut a few strips for this mystery from my stash. The finale of this quilt should be posted this month so I hope to have the blocks sewn together soon. 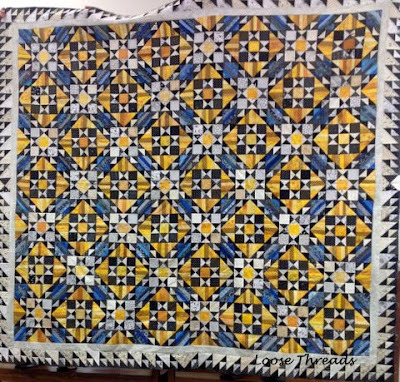 Here is Nancy M.'s Grand Illusion mystery quilt from 2014. This is Trudy's Jamestown Landing. The pattern can be found in Bonnie's book String Fling. This one is Tumalo Trail also done by Trudy. She finished putting the top together at the retreat. I've been working on these 3 mystery quilts for awhile now and have been busy decorating for Christmas. It's not too late for you to get a start on these mystery quilts, too.